A unique petroglyph discovered near the Atlantic coast of northern Spain (Galicia) has provided evidence that contacts between ancient Atlantic cultures and contemporaneous cultures of the Mediterranean were earlier and perhaps more intense than previously thought. The rock art panel, located in the Costa dos Castros region and known as Auga dos Cebros, depicts a boat with a structure, including a combination of oars and sails, that match the general design and concept of seafaring vessels of Mediterranean cultures roughly 4,000 years ago. The typical Atlantic equivalent boats of the time were known to feature primarily oar-propelled boats without sails, with a different overall form. 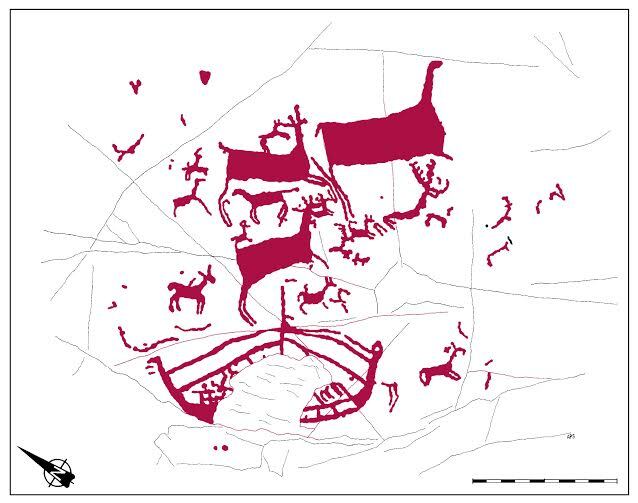 When first encountered, the petroglyph piqued the interest of researcher Javier Costas Goberna, who first began searching for comparable evidence and renderings in the archaeological record throughout Europe. Coming up empty, he turned his attention to researching the Mediterranean regions. His search here proved fruitful, discovering evidence of very similarly designed vessels as evidenced by a variety of archaeological finds. In fact, fellow researcher María Ruiz-Gálvez Priego identified the Auga dos Cebros boat as being remarkably similar to Aegean model vessels of approximately 2000 B.C., particularly as they were depicted on ancient Cretan stamps. Like the Auga dos Cebros boat, those vessels featured outwardly-opened bows and sterns, masts and rigging that held sails as the primary means of propulsion, and lines that are interpreted to represent oars and/or oarsmen for secondary, additional propulsion. Combined with the fact that the Auga dos Cebros petroglyph represents the only such depiction of this type of seafaring vessel in the Atlantic/European region characteristic to the Bronze Age time period, the researchers posit that the Auga dos Cebros boat likely traveled from a Mediterranean point of origin, suggesting contact or trade with Atlantic cultures as much as 4,000 years ago. More about this important discovery, including images, can be found in the Dig Ventures article by Maiya Pina-Dacier.